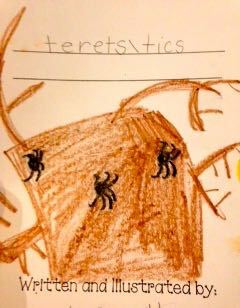 The other day, I pulled this out of my 2nd grader’s backpack. He wrote a book. He wrote it for his brother…and I love it. 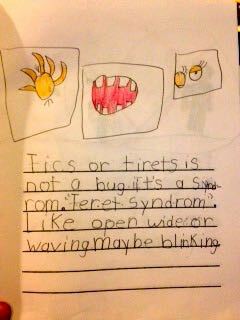 Tics or Tourette’s is not a bug. It’s a syndrome. Like open wide or waving. Maybe blinking. Tourette’s is also disrespected. It shouldn’t be. 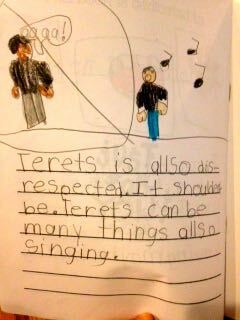 Tourette’s can be many things, also singing. That’s not all. 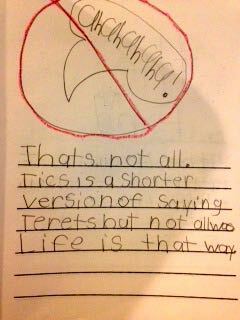 Tics is a shorter version of saying Tourette’s but not always. Life is that way. My brother has Tourette’s and people disrespect him. I have 2 dogs and a lizard. 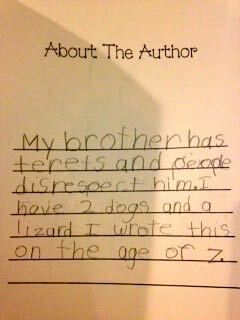 I wrote this on the age of 7. And so when I read this, I cried. It was a full on tear drops-on-the-shirt-grab-the-Kleenex cry. He has never mentioned the tics in a negative way to his brother. Not once. Not ever. 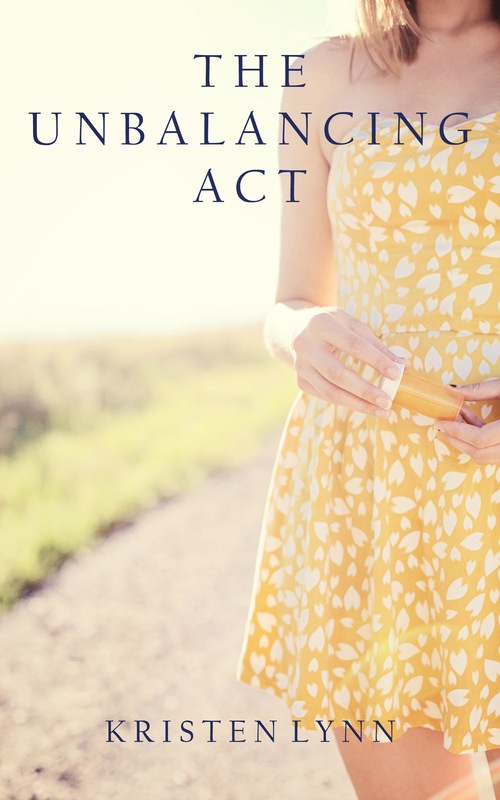 We’ve certainly talked about it to him and it’s definitely not a taboo subject in our home. But we are all so used to it. So I never really thought about how he perceived the whole thing. But now I realize that my 7 year-old notices the stares and the whispers when we go out. He gets it. As the mother of a child with Tourette’s, I worry. I worry A LOT! I worry about the misunderstandings associated with TS. I worry about how my child will be treated in life (Yes, one of his tics is singing and I love it, and it’s always rock, like really good rock too. He has great taste in music). But…I worry about my other child too. I worry about everything in his life and how he’s doing and if he has a friend to play with at recess or not. I worry about if he’s happy and confident and if he’s gonna catch Ebola and every other thing in the world. I’m a mother and I can’t help it. But my boys are best friends. That’s why this means so much to me. As much as I worry about both of them, they have each other. They. Have. Each. Other. And there’s a cute little book made out of card stock that proves it. ← National Give A Mom A Nap Day 2015. I’m Starting This. Get Involved. I love this story. Your son sounds amazing and smart and confident, all at the age of 7! It’s so wonderful that your boys are best friends. I love my siblings, and I love my parents for helping us become friends instead of rivals. Even when I get frustrated with the rest of my family, I know my siblings are always there for me, and I can’t stay mad at them. I’m glad your boys have each other! Thanks for sharing this!